(Newser) – A museum has restored the longest painting in North America so it can share the story of American whaling with the public. 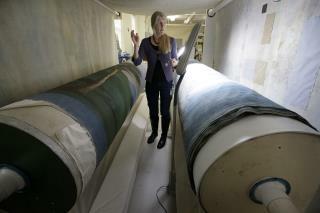 The New Bedford Whaling Museum enlisted the help of a textile conservator to fix the "Grand Panorama of a Whaling Voyage Round the World." Now it's searching for a large venue to display it, scouting locations in New Bedford, Massachusetts, but open to considering Providence, Rhode Island, or Connecticut's Mystic Seaport, the AP reports. Benjamin Russell and Caleb Purrington created the quarter-mile-long, 8-foot-tall panorama to capture all aspects of a whaling voyage. It would be mounted on a system of cranks and reels to go across a theater stage as a narrator told stories of hunting whales and processing their carcasses. It toured the US after it was completed in 1848. But the panorama deteriorated after so much traveling and went into storage. D. Jordan Berson, who's managing the project, spent a year spraying the panorama with an adhesive to stabilize a paint layer that had powdered over time. The conservator stitched up marred sections, repaired thinning areas of the fabric, and fixed holes and tears. Each section has been photographed and merged into a large digital image so it can be shown moving, just like the original experience. The restored artwork will be static, however, meaning the museum needs a room that's at least 16,000 square feet. The museum has spent $400,000 raised from individual donors, private foundations, and government grants to conserve, digitize, and store the panorama. "as a narrator told stories of hunting whales and processing their carcasses" Are they sure the public wants to see and hear this? I suggest Greenpeace head quarters or Rosie O'Donnell's bathroom.